Chicken wing connoisseurs! Super Bowl Sunday — the day that Americans eat more chicken wings than any other — is right around the corner, and just in time for it, you have voted for Best of Bushwick 2018: Chicken Wings. Salud was opened by June Ramirez on Nov. 1, 2015. 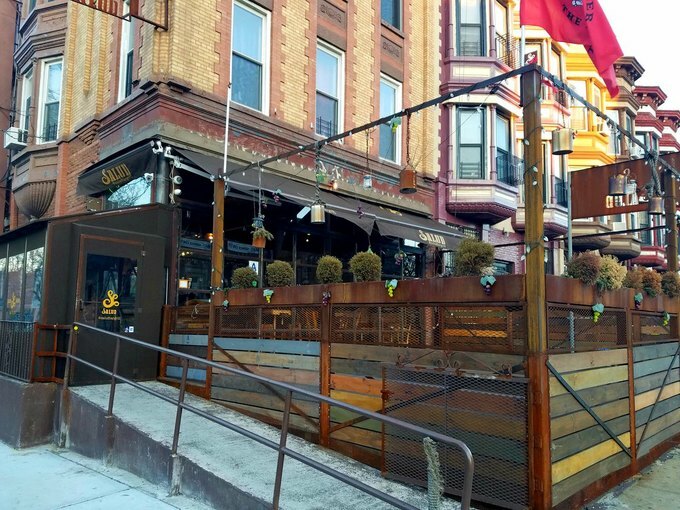 Located at 1413 Bushwick Ave. deep in the southeast of Bushwick, Salud serves up Latin classics like papitas fritas, empanadas, and oveto, as well as Latin-inflected American classics such as burgers, pork chops, and, yes, chicken wings. It also has a formidable craft beer list. Salud Bar & Grill, 1413 Bushick Ave.
Ramirez is a Bushwick lifer, having moved here at a young age with his family from the Dominican Republic in 1990. 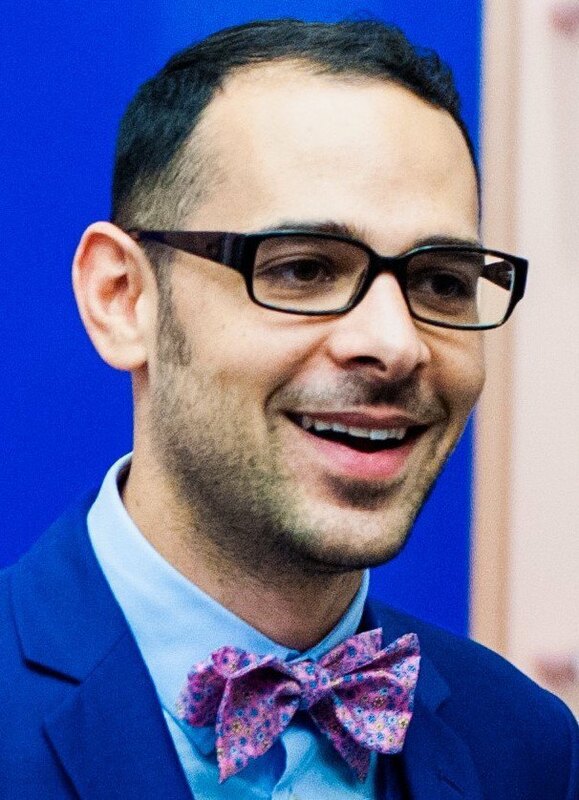 In 1997, at the end of middle school, he got a job cutting hair at a local barber shop. By 2003, he had joined up with another barber and opened his own shop, Metro Barber Shop on Wilson Avenue. Ramirez has a passion for get-togethers, cooking, and delicious craft beer. When he started itching for a change of pace, a beer-focused bar made sense. 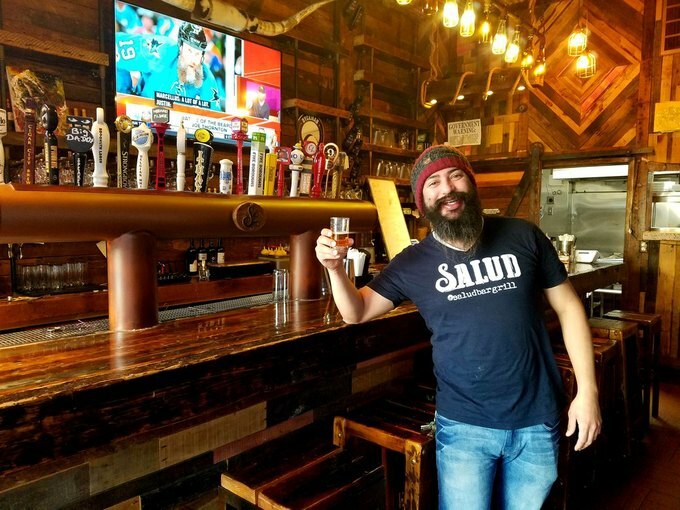 Salud is a very comfortable spot, rich with locally-reclaimed wood and brassy, industrial accents. Huge windows open onto a spacious enclosed porch out front (open during warmer months). This is a place where, when you come in, you won’t want to leave. Of course, you’re here to read about chicken wings. The wings at Salud are top notch. 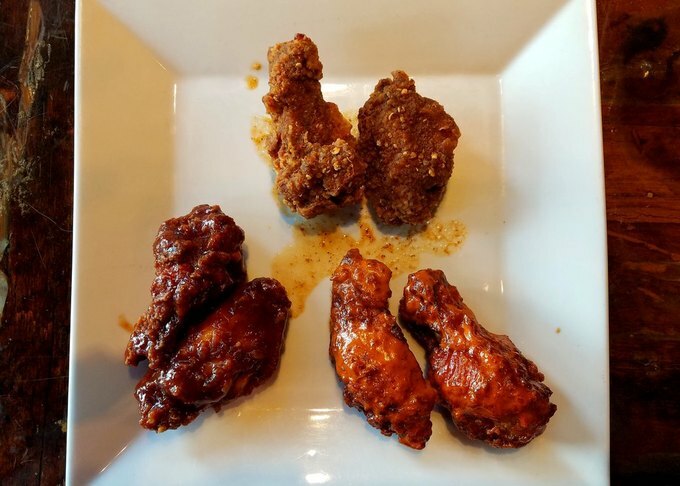 For one thing, they are hands down the crispiest wings I’ve ever had. This is probably thanks to their simple preparation: they are soaked in buttermilk, lightly coated in flour, and then fried fast and hard. The results are perfectly juicy meat and a light, but substantial, coating that cracks between your teeth. Not a jot of excess grease will be found. And the flavors! 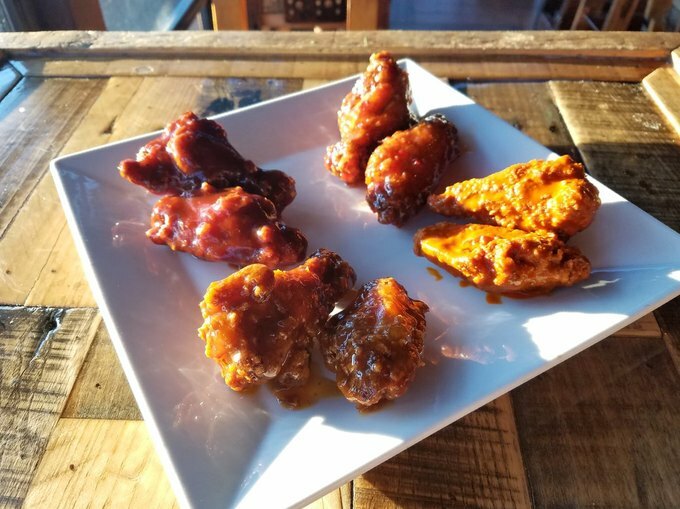 Where spots typically offer the generic mild, medium, and hot, Salud offers eight flavors: naked (unsauced wings), barbeque, spicy barbeque, classic buffalo, sweet chili, chipotle, mango habanero, and fuego. While there wasn’t a bad taste in the bunch, chipotle and fuego were the standouts for me. The chipotle had a gorgeous smokiness and a pleasantly warm-building heat. The fuego, though, was something truly special. The flavor isn’t available all the time, because Ramirez makes it himself. He uses only peppers that he grows in the backyards of his home, Salud, and Metro Barber Shop. The fuego is a combination of multiple pepper varieties, including ghost, chocolate ghost, Trinidad scorpion, scotch bonnet, red habanero, orange habanero, and devil’s tongue. Your first taste is of the gorgeous, bright fruit flavors that you get from the habaneros and scotch bonnets, but with a light floral undertone. Then the heat — assertive but not overwhelming, at least to my palate — kicks in. It’s a full heat, one that tingles your lips and tongue, flushes your cheeks, and gets you sweating a little bit on your brow. As you acclimate to the heat, the fuego sauce starts to take on the flavors of a classic Jamaican jerk, warm and herbal. I suspect that it is the fuego that helped Salud win Best of Bushwick 2018: Chicken Wings. Ramirez was honored to be voted for. "I'd like to thank everybody that took their time to vote for us," he said. "We really appreciate you. We'll continue to make the best wings in Bushwick. This Super Bowl Sunday is actually an ideal time to sample Bushwick's best wings — Salud puts on an annual halftime wing eating contest. Entrance is free, and there are prizes! The first place winner, the person who clears their plate of fuego wings fastest, wins a $100 Salud gift certificate, a shirt, and a hat; second earns $50 to the restaurant, a shirt, and a hat; third gets $25, a shirt, and a hat; and all participants will walk away with a shirt or cap (and a belly full of delicious wings). Stop by Salud to sign up today. Comfortable local beer bar with a large craft selection and Latin & Latine-influenced American bar food. 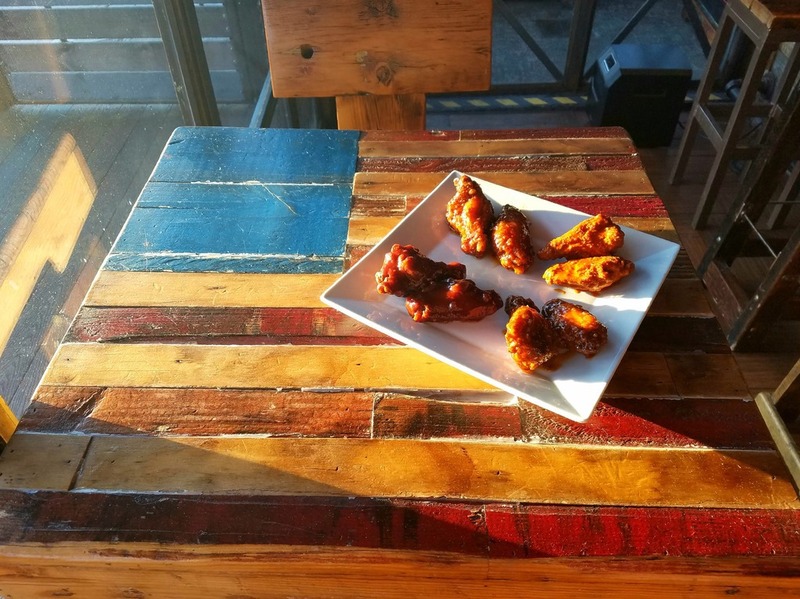 Winner of Bushwick Daily's Best of Bushwick 2018: Wings. Follow the Salud Bar & Grill on Facebook and Instagram.